Congrats! You received a Random and Kind Tag that hopefully made your day a little better! This tag represents a random act of kindness (RAK) that a complete stranger performed for you. You may have not seen them do it and a “Thank You” isn’t even necessary. All we ask is for you to spread the kindness by passing on the unique tag to someone else! 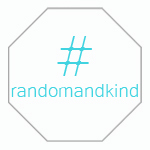 Spread the Random and Kind movement by passing on the unique tag you received to someone else by performing any kind act. Big or Small. Free or Not Free. Stranger or Friend. Each tag you hand out will lead the recipient back to this site and hopefully they will continue to spread the movement! Click here for a few ideas. Tell us about the random and kind act that was performed for you! Your story will be used to spread ideas and inspire others. Plus, it will be fun to see where the nicest people reside! No personal information needed. Share the Tag #, where, and how you received your tag! Then, pass on the good vibes by doing something nice for someone else and passing your Random and Kind TAG to someone else. Remember to check back on this page to see if someone returned your TAG number in these comments.